Designed by an award-winning artist Moore, famous for his fantasy sculpture artwork, has tamed this crazy 35″-long monster to serve your visitors in a different style! This table is sculpted 360-degrees and topped with a 3/8″-thick, thick pencil-edged oval glass top so that he could be admired from all angles. A person who is into art or sculpture would love to have Contemporary Sculpture Cat as a gift. Hand crafted and hand painted statue, designed and Sculpted by Matt Buckley. It could be Absolutely purr-fect!! gift for your decor. Size 15 X 13 inches and depth 9.5 inches. Do you like the artwork? 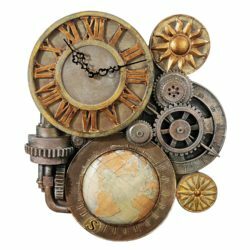 Well, this Gears of time sculptural wall clock is a perfect work of art. Hand-casted using real crushed stone bonded with high-quality designer resin. Each part is separately hand painted by an artisan. This art sculpture will get all the attention on your wall.